was a bookkeeper and clerk by profession. 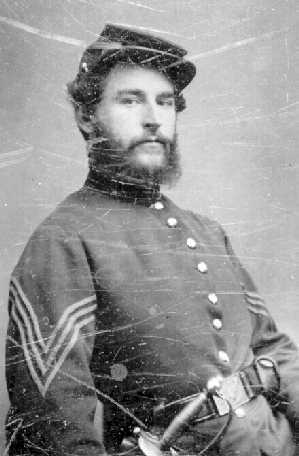 He was twenty-two years old when he enlisted with the Union Army. Molineaux was a cheerful and optimistic diarist who enjoyed recording the weather, events of the war, and sites associated with the march. Monday 11 May, fine clear morning. We have just had rations renewed that gave breakfast. Have been out of coffee for several days and are now supplied with 28 pounds. We marched about 4 miles and our cavalry met a small force of the enemy. So our regt. was divided up and thrown out different roads as pickets. We are on cross roads here and an important place to hold no doubt. We were thrown out on a road running to the R.R. 14 miles to Edwards Dept, 30 miles to Vicksburg, 26 miles to Jackson (by finger board). We took one Rebel prisoner named Harris and the horse of his messmate and several mules. He seemed a fine smart fellow. His mother is left alone a mile from where we found him whom he seemed troubled about. We have been living "gay" on chicken etc. Co. F of the 45 Regt. is to relieve or assist us tonight. At night we took turns and were on the reserve and I got some two hours sleep. We as well as the entire army have now to be up and under arms at 3 ½ a.m.
Tuesday 12 May, fine morning. The corps move out today again toward Raymond. We are in the rear of division. We move slowly quite a train along - some 5 miles out and we hear heavy cannonading ahead. I guess the ball is open now. Sure enough, it proves to be so and we were hurried right ahead and our Regt got together and were marched to the extreme right of where seemed to be the heaviest fire but we were not sufficiently useful here and were moved again to the right center where the 23rd Ind. & 20th Ill Regts were under heavy fire and we made a charge as grand as had been made during this war. We commenced about 20 yds. Before we got to the line formed by the above Regts who were hugging the ground close and set up a yell as if all the fiends of Hell had broke loose and rushed right over those Regts and over the creek or run which was some 10 to 15 ft deep, some 2 ft. of water. Here many of us fell killed and wounded so that the stream was crimson with blood. Our Co. had but one Corpl killed. Wounded in the thigh. We were lucky. We followed them right up a bluff some throwing away their arms and all. We pushed them by the point of the bayonet and captured many prisoners. Broke their center and turned the whole fortunes of the battle for it put the entire force in route and after we had but an artillery drill and Gen J. Gregg sent over a flag of truce to ask permission to bury their dead which could not be granted. In a short time our whole force was advanced in line of battle for 2 miles over a newly ploughed corn field and to the Town of Raymond, county seat of Hinds Co and the Stars & stripes raised over the court house for the first time for 2 years. We enjoyed our victory amazingly and marched through and beyond the Town singing the "Union Forever" etc. This is quite nice little place, good location for a town. We stacked arms and camped on the commons and slept without knapsacks which we had piled up 3 miles back. Think it was never as hot. The dust in road nearly knee deep . The Rebs are said to be 5 miles from here toward Jackson where we will fight them again probably today or tomorrow. We marched to where we fought a distance of 9 miles from where we picketed last night. Wednesday 13 May, fine clear warm morning. I have not yet ascertained our loss. Capt. Leper acting as major was mortally wounded. He lived an hour only. We left the town about 10 a.m. marched through the dust about 8 miles Around 4 p.m. a heavy thunder shower set in and we kept along through it wet through to the hide. Camped in the outskirts of Clinton which is another fine little town. Called up in line at 3:a.m. Ceased raining during the night but very cloudy. 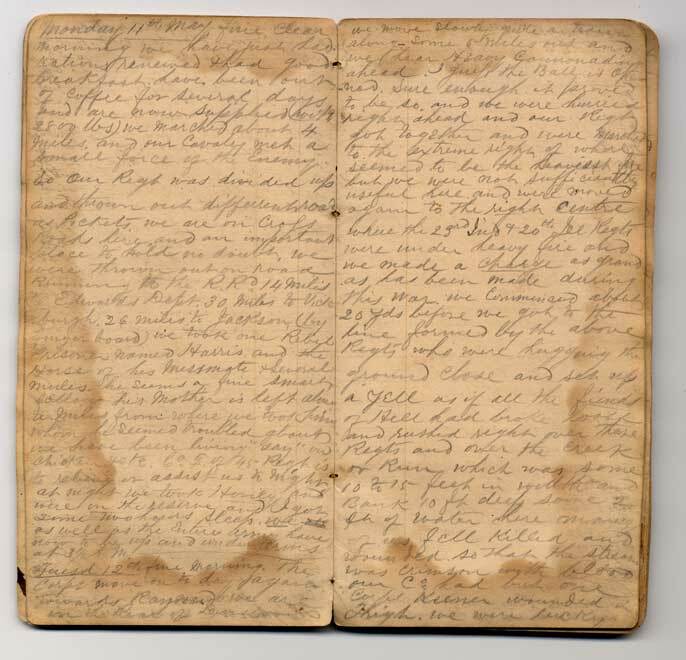 Pages from Molineaux's diary, May 11 - 12, 1863, courtesy of Augustana College Library.